This is the second part of an essay that ran last Tuesday. Read Part 1 here. I believe that every citizen of Canada, from students to adults (including political leaders), would gain from a progression towards more sophisticated forms of historical consciousness that encourage critical distance and informed opinions, and cultivate the capacity to “digest complexity” – both human and societal. Memory and identity politics thrive on tribalism and cognitive simplification. They promote projects and muster support based on political agendas that evade complexity. Yet, societies and their pasts are highly complex and multifaceted, and need to be analyzed and recognized as such. Representations of the past, and possible courses of action, might better be informed by this sense of historical complexity. Any attempt to delineate this intellectual complexity of historical consciousness runs the risk of cognitive and normative generalization but in this article I hope to offer a conceptual map as a starting point for further discussion (and transposition) on how “types” of individuals are most likely to engage in issues of commemoration, using the Canadian situation as an example. 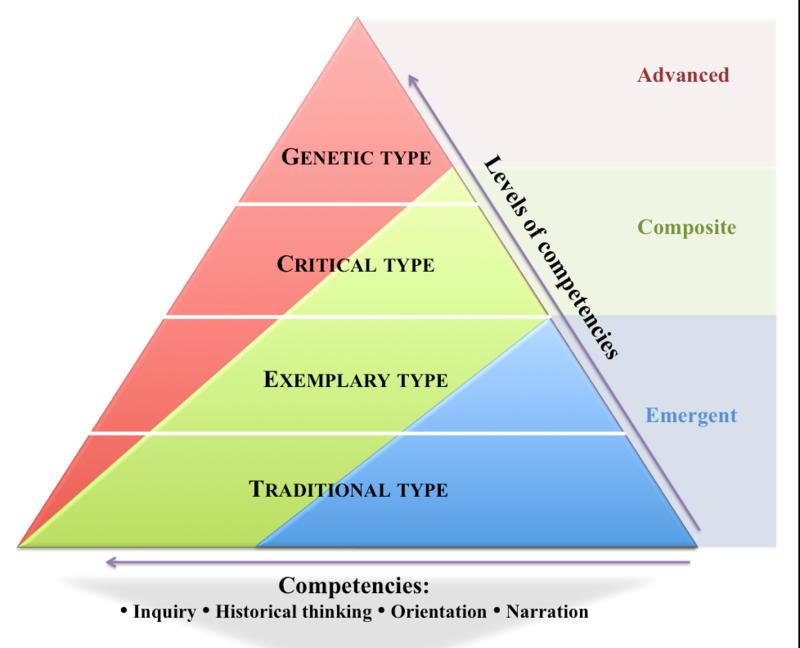 This model (see Chart 1) relies on the competencies of historical consciousness in relation to Rüsen’s typology, which I discussed in part one, outlining four related ways in which Canadians can possibly position themselves with regard to debates over John A. Macdonald’s statues or other sites of memory. For example, the “traditional” type represents the individual who is most concerned with how to preserve monuments as a way to uphold a certain memory tradition seen as necessary for orienting life in the present (e.g., statues of Macdonald help Canadians memorialize a nation-builder who fought for the creation of Canada as a sovereign nation in the world). Such a person will engage in inquiry, historical thinking and narration as way to generate a story that will provide useful guidance in establishing a traditional vision for stabilizing the future of Canada. The “critical” type, on the contrary, represents the individual who sees such monuments as anachronistic representations of another era that poorly fit our own modern times (e.g., statues of Macdonald were created in the past to promote English Canadian nationalism and white supremacy). Replacing them is seen as necessary to design more contextually-situated representations of today’s society through counter-narratives that serve to justify present-day standpoints and moral values. The “genetic” type holds a broader, more complex vision of temporality and monuments as forms of commemoration over time. For them, the study of monuments, such as Macdonald, serves to reveal how individuals were commemorated in Canadian history and what brought about change to acts of commemoration (e.g., why were Canadian monuments representing white male figures? What led to change/addition of other significant figures?). These forms of commemoration generate multiple-perspective narratives (plurality of standpoints) that integrate how memorials have changed over time and draws attention to how they might be improved (now and in the future). Inquiry History is fixed and known by authority. Questions are designed to provide straightforward, definitive answers through common sense, real-life practice. History has its methodology. Questions serve to investigate comparative cases for present-day consideration and useful lessons. Individuals ask for cases of commemoration, with interest in identifying those forms of memorials which best signify individual/ collective heroism and dignity, or which best express regret/mourning. History has methodologies to study the past. Multiple questions can generate different forms of inquiry and representations of the same past. Individuals have different questions and sets of concerns highlighting cultural relativity. Individuals ask for commemorations and memorials which “fit our time” in the same way older monuments fitted theirs. History has methodologies to study the past. Questions are contextually situated and generate forms of inquiry and representations that are open to criticism and revisions. The future generates additional questions about the past. Individuals ask for fundamental ways to change or improve commemoration in contemporary society. Historical thinking Abilities to think historically are reduced to obligations to pre-given moral stances. No distance between past and present. Traditions provide stability over change, so no need to question their value and significance. Study of monuments to consider their important social functions (e.g., to help English Canadians memorialize past heroes and hold on to their cause). Abilities to think historically favour the application of a time-honoured analytical process that provides definitive rules and principles for actions. Experiences from the past represent temporal changes, valuable lessons. Search for rule about how best to commemorate past leaders informs the questions the person asks (inquiry), the methods (historical thinking), orientation, and their narrative. Abilities to think historically reveal the contextual nature of our own self (positionality). Historical significance, morality and continuity/ change are delimited by one’s own interpretative framework. Examination of the development of Canadian memorials under the question of how each “spirit of the times” has shaped the monument, guided by historical thinking methods orientation, and narrative representations of the time. Abilities to think historically are based on concepts, rules and criteria. Context varies across time and place which limits our capacity to generalize from past events and impose our moral frameworks. Study of Canadian monuments, probing what initiatives moved commemoration forward (e.g., how and when marginalized groups were included/excluded), and paying attention to ways for improvement. Internalization of a pre-given sense of life shaped by the permanence of the group to which one belongs. Past, present, and future are bound in a sense of eternity. These monuments are represented as essential to define their own roots, traditions, and sense of self. Specific concepts and cases offer general rules and principles for orienting our present-day life. The dimensions of time are recognized and connected through general rules for guiding our actions. Monuments are explained in terms of their development and their differences. They serve as examples for a certain type of commemoration. Individuals feel no obligation to predecessors but establish value-laden principles to define their own course of actions. Past, present, and future are distinct and only connected through a negative sense of rupture. Monuments of another era are in rupture with today’s moral values. There is a need to generate new ways of commemorating for orienting our own present-day life. Continuity and change are relational and essential to life orientation. They give history its sense and purpose. Temporalisation is a decisive instrument for the validity of historical claims and moral values. Dimensions of time are connected as a path for future possibilities. Commemoration is explained in terms of developments in a directed change, campaigning for specific forms of commemoration beyond monuments that promote insight and perspective-taking. Narrative Narratives are windows to the past, tell true stories which serve to confirm present-day personal relationship with the past and to stabilize identity. Monuments tell stories which ascertain the permanence of the group and provide guidance in establishing a traditional narrative vision for the future of Canada. Narratives are constructed representations which offer useful lessons by providing historical generalizations or points of reference. Narratives provide useful examples for orienting life in time and instructing Canadians through lessons they can learn from. Narratives provide counter-arguments to grand narratives and serve to formulate one’s own established narrative standpoint. Findings serve to generate new contextually situated narratives that are more appropriate for Canadian present-day purposes and individuals’ positionalities. Narratives offer plausible representations of the past to orient our life that are open to revision and scrutiny. Different stand-points can be assessed for their plausibility and be integrated into a vision of temporal change. Forms of commemoration beyond monuments generate multiple-perspective narratives that integrate memorial change over time for Canadians. Of course, this model has its own limitations. It does not account for all possible standpoints for dealing with monuments, and one can easily reduce individual’s complexity to a prescriptive set of competencies and dispositions. Furthermore, research on models of progression in historical reasoning suggests that learners have inconsistent behaviours when researching, narrating, and thinking historically. Indeed, it is completely understandable that individuals make sense of the past as an uninformed mixing of different levels and forms of competence. As Denis Shemilt and Peter Lee have argued, learners’ historical ideas do not develop in a linear manner; they are decoupled. Learners can ask questions of commemoration at a critical form/level (what monuments fit our own time?) but reason through a traditional competence of historical thinking (what is the true story to answer my question?). In the same way, there is no clear guarantee that progression from left (traditional) to right (genetic) will take place in prescribed locksteps and ultimately lead to a societal consensus on how to deal with contested history or monuments. Is progression in historical consciousness possible? Is it ever possible to conceive a progression model for making sense of history complexity? For Körber, affirmative answers to this question should necessarily consider structural change in people’s thinking not only in reference to “types” of consciousness, but also in addition to a third dimension that can possibly serve to highlight this sense of contingency and decoupling described above (see Figure 1). This additional, tridimensional layer illustrates that progression of historical consciousness is not exclusively a question of “types” because it can also take place “vertically,” that is, through an individual’s own ways of knowing and engagement with such matrix of meaning-making. In other words, people’s historical ideas and beliefs are informed by their own sense of temporality, knowledge, and metacognition – a psychology of historical consciousness – that shape their capacity to learn and reason. For matter of clarity, I have delineated three possible levels of competencies informed by the ideas of Körber in his critique of my work. 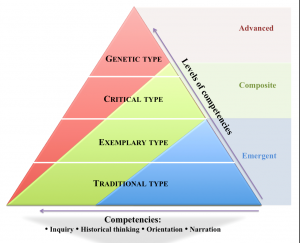 At the most basic (emergent) level, individuals are unable to realize and understand the different types and set of competencies to deal with history and commemoration. They simply apply prescriptive models and set of competencies in a mechanical way, and use narrative representations according to their own unconsciousness sense of self. This basic level is often found in school when learners naively apply a model or theory for scholastic activities without thinking about the process or the theory itself. With regard to commemoration, this level (re)presents individuals who intuitively adopt a position on monument controversies without the ability to understand how they think (metacognition) and how others might think and position themselves. This level is also closely linked to the so-called “Dunning-Kruger” effect in cognitive psychology, which points to the inability of unskilled people to recognize their own flaws. Indeed, without the self-awareness of metacognition, these individuals cannot objectively evaluate their actual competence or incompetence in making sense of history. At the intermediate (composite) level, individuals can (a) understand the nature of historical thinking, and (b) realize their own inconsistencies in how they engage with and think about monuments as sites of memory. They may also aim to (c) progress in the sophistication of their own ideas about debates over monuments and narratives about them. At this level, as Körber contends, “people will be able to discuss the message a monument expresses and the meaning it has for us today, but they might disagree and even quarrel because they apply different patterns of meaning-making.” In many ways, this level represents the “standard achievement” in historical thinking because learners’ historical ideas are informed by more general stances and understandings of history as a discipline (as defined in Figure 2 from part 1, the cogwheel model of historical consciousness) which generate different forms of orientation and narration. At the highest (advanced) level, learners are totally conscious of (a) their own competence and incompetence as well as (b) the power and limitation of typologies of historical consciousness themselves. They are “in full command” of their historical reflection, able to realize inconsistencies and flaws in their own thinking and the thinking of others. They can even suggest alternative models of analysis and representations or new meaning-making typologies (different from the ones I presented) for purposeful life orientation. At this level, individuals understand that people approach contested monuments with distinctive prior knowledge and established moral and political “types” (their positionality) but they can reflect on ways to better represent these ideas or to enhance the sophistication of these ideas through other models or levels of consciousness. The ideas presented in these two posts are still highly theoretical and suffer from poor empirical testing and educational validation. That being said, I believe they offer an interesting blueprint for discussion on ways to understand and represent Canadians’ own ideas and positionalities about monuments and contested history and, perhaps more importantly, devise related strategies and tools to promote more informed engagement and decision-making. So far, the Canadian strategy for dealing with past and new monuments has been highly political and obscure, often delineated along partisan lines. The role of scholars and organizations such as Active History is precisely to connect historians with the wider public and offer alternatives approaches to “doing history.” Surveys such as Canadians and their pasts reveal that history plays a significant role in providing citizens with a sense of direction and meaning for their fast-changing world. People don’t live beyond history; they live through history. But history is complex and contested and it is our role to help Canadians find better ways to engage in this historical complexity. Stéphane Lévesque is professor and director of the Virtual History and Stories Lab at the University of Ottawa. An original version of this article was published by Stéphane Lévesque, Removing the “Past”: Debates Over Official Sites of Memory Public History Weekly 6 (2018) 29, DOI: dx.doi.org/10.1515/phw-2018-12570. Copyright (c) 2018 by De Gruyter Oldenbourg and the author, all rights reserved. This original work may be copied and redistributed for non-commercial, educational purposes, if permission is granted by the author and usage right holders. For permission please contact the editor-in-chief (see here). All articles are reliably referenced via a DOI, which includes all comments that are considered an integral part of the publication. Andreas Körber, A new competency-model on monuments using Rüsen’s four types by Stéphane Levesque — and a comment. Historisch Denken Lernen / Learning to Think Historically Blog Post, published on 15 October 2018. https://historischdenkenlernen.userblogs.uni-hamburg.de/index.php/2018/10/15/a-new-competency-model-on-monuments-using-ruesens-four-types-by-stephane-levesque-and-a-comment/. Margaret Conrad et al., Canadians and Their Pasts (Toronto: University of Toronto Press, 2013). Interesting post and I am glad you cite psychology paper, albeit a dated one, here. In my view, one can’t credibly talk about social memory without using concepts from psychology, most obviously confirmation bias. You are obviously familiar with this literature. However, I think that in accounting for heterogeneity im how individuals respond to the politics of social memory, you could profit from looking at the new literature on Moral Foundations Theory, which seems super relevant here.